Only applies to MLB game jerseys. Rudy-Does it matter where the set tags are placed-some at the bottom or to the right-on the label? Are the label,set tags,and extra length tags sewn at the same time? That is some very good info. It is a primer and there are always exceptions to everything when dealing with jerseys. For example I have a 1993 gamer that has the "1992" style tagging. Probably a carryover, though I only have 1 from the team so I can't compare with others. I own 2 jerseys from 2001 and they have the "2000" style tagging, possible carryovers. Here are 2 other examples I found, all of my jerseys are Seattle Mariners so they are my only comparison. 1996 Teal alternate jersey with the new wash instructions. 2004 Tagging Variation, Notice there is no eagle profile in the bottom part of the "R". It's only on 2 of the 2004's I own, the others are of the "2001-2005" style. The last Russell tag photo in Spiezio's post debuted in 2004. The biggest change is obviously in the Russell Athletic logo. I believe the photo in Rudy's primer for 2001-2005 is actually correct for 2001-2003 only. 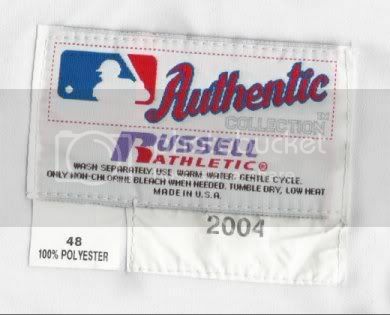 There were no Russell jerseys worn past 2004, making the 2004 tag pictured in Spiezio's post a one year style tag. Thanks for all the insightful comments. I've incorporated them into a revised version of the 'primer' and posted an updated image in place of the older one. Swoboda: I believe the flag tags & set tags are sewn underneath the main manufacturers tag. This would mean that these tags would be sewn on first and the manufacturer label sewn on top. See my reply to your similar question regarding rawlings tags in the rawlings primer. I too have seen several 1993's and 1994's with the '1992' style tagging and simply assumed they were carry-overs. Carry-overs arent uncommon. Same goes for your 2001's with 2000 style tagging. I have noticed carry-overs with Wilson and Rawlings jerseys as well. The majority of 2004's I've seen had 2001-2003 style tagging. Very few had the 2004 style you've shown. This simply indicates to me the prevalence of carryovers. Rob: Good call. I don't know why i put 2005. Sloppyness I suppose. Majestic pretty much handled the entire MLB in 2005. One of the main benefits of these primers is to help people identify fakes. It would be common, for example, to see 1993 jersey with 1992 style tagging or a 2004 jersey with 2001-2003 style tagging. It should be impossible to see a 1993 jersey with 1997-1999 style tagging. When I set out to do Russell tags, I thought it would be a pretty short list because the white Russell label always looked the same to me. Someone could've easily doctored up a 1997 jersey with a 1992 player name and I wouldn't have been able to tell the difference simply from the Russell tag alone. Now I can. While I agree with Spezio that 'there are exceptions', it's impossible to travel into the future so this primer should help detect jerseys with tags that don't match the era. (eg: a '1992' jersey with 1997 style tagging). For those interested, when I make these, I try to collect as many tags as I can possibly find for each year. I typically end up with about 25 tags per year from both american league and national league teams. I organize them by year and then try to spot the changes and re-designs. Rudy, in 2004 Russell changed there tags again, the ATHLETIC in Russell Athletic was changed in style and color. They don't care as much as we do! Just to clarify, there were no Russell jerseys worn in the Major Leagues in 2005. Every team is now contractually obligated to wear Majestic jerseys. Oh yeah, I edited my previous post, as I was half asleep when I posted it. When you find a 2005 Russell, 1st email Rudy, then call Ghostbusters. Hello, I was wondering if a jersey had the correct tagging, but was missing the year tag, such as the year "2000" was missing, would that indicate it was a retail jersey. 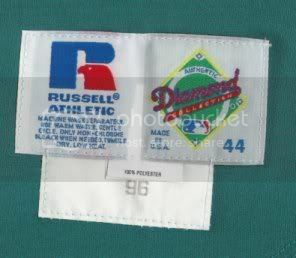 on mlb russell jerseys, the use of year tags or strip tags are up to the discretion of the individual team. some teams used them, some don't. this can vary every year. what specific team and year are you referring to?